These arms bolt to your vehicle with two 10-24 screws. Arms are 6-1/4" long and protrude from the vehicle 5". Arms angle up 20 degrees and angle back 35 degrees. Mount base is 2-3/4" x 1/2". Mount holes are 1-5/8" apart. Comes with rubber gasket. Comes in a show polished finish. Sold in pairs. These arms bolt to your vehicle with two 10-24 screws. Arms are 5-1/2". Arm raises mirror up about 3" and out from body about 4". Mount base is 1" x 1/2". Mount holes are 1/2" apart. Comes with rubber gasket. Comes in a show polished finish. Sold in pairs. These arms bolt to your vehicle with two 10-24 screws. Arms are 5-1/2". Arm will raise mirror up about 3-1/2" and out from body about 4". Mount base is 1" x 1/2". Mount holes are 1/2" apart. Comes with rubber gasket. Comes in a show polished finish. Sold in pairs. These arms bolt to your vehicle with two 10-24 screws. Arms are 5-1/2". Arm drops mirror down about 3-1/2" and out from body about 4". Mount base is 1" x 1/2". Mount holes are 1/2" apart. Comes with rubber gasket. Comes in a show polished finish. Sold in pairs. These arms bolt to your vehicle with two 10-24 screws. Arms are 3-1/2". Arms angle up 20 degrees and angle back 10 degrees. Mount base is 1" x 1/2". Mount holes are 1/2" apart. Comes with rubber gasket. Comes in a show polished finish. Sold in pairs. These arms bolt to your vehicle with two 10-24 screws. Arms are 5-1/2". Arms angle up 20 degrees and angle back 10 degrees. Mount base is 1" x 1/2". Mount holes are 1/2" apart. Comes with rubber gasket. Comes in a show polished finish. Sold in pairs. This arm bolts to your vehicle with two 10-24 screws. Arms are 5". Base can be rotated every 30 degrees. Mount base is 1.5" x 5/8". Mount holes are 15/16" apart. Comes with rubber gasket. Machined from aircraft aluminum, show polished finish. Sold individually. This arm will bolt directly to a 1932 windshield frame. Thread is 3/8-24. Comes in a show polished finish. Sold individually. This mirror post mounts to roof or top of dash with two #10 screws, holes are 1-1/2" apart. Post is 3-1/2" long. Polished finished. Sold individually. 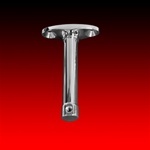 This mirror post mounts to roof or top of dash with two #10 screws, holes are 1-1/2" apart. Post is 2" long. Polished finished. Sold individually. This mirror post mounts to the center of a Duvall style frames and other split windshield applications. Polished finished. Mounts mirror at a 45 degree angle. Sold individually. Mirror head not included. This mirror post mounts to the windshield. Comes with adhesive.